Hey Friends! You know what? Let’s take a break. No, not like Ross and Rachel took a break! Let’s take a break from work and enjoy some internet mindlessness. Let’s get on Twitter and tweet some silly stuff to break up the celebrity crap and political brushfire. Or let’s just check out some emoticons and emoji that make us smile. Twitter is a great place to say whatever’s on your mind, as long as it’s less than 140 characters (although there have been rumors of Twitter allowing more characters, which they’ve already done for direct messages. What?!). First of all, let’s talk about the icons that are specific to Twitter. Unlike Snapchat, there aren’t a lot of app-specific icons to keep straight, so this won’t take long. This panel of icons greets you at the top of every Twitter screen. There’s a (slightly) modified version that shows up at the bottom of the screens of the Twitter App. Most of these are pretty self-explanatory, but let’s go ahead and make sure we’re on the same page. This is just the Twitter icon. Accept no substitutes. This is for the home screen. It’ll take you to your Home page where you can view all the tweets that are showing up in your feed. This is mostly going to be the tweets and retweets of people you’re following, but there are usually ads and “sponsored content” in the mix as well. Hey, Twitter’s gotta pay the bills somehow, right? Moments are a new addition to Twitter. Moments allow you to see the best of what’s happening on Twitter without the previous hassle of having to follow the “right” people. Big things happening in the news, the world, entertainment, politics, even dogs, you can see the top tweets about that subject all in one place. More on Moments and changes at Twitter later. Finally, this is for messages. These are personal messages that you can send and receive from your friends on Twitter without anyone else seeing them. As mentioned (and linked) above, Twitter has recently shed the 140 character limit when it comes to messages. Before we get to those fun emoticons and emoji (emojis? Oxford says either is acceptable, although it has not been codified. We know you’ve been wondering as much as we have), let’s take a minute to distinguish between the two. THEY ARE NOT INTERCHANGEABLE! Sorry, we had to get a little emphatic, there. We’re not only passionate about bringing you the latests in apps, but also equally as passionate about grammar. We’re sure you are as well. Emoticons are defined by Merriam-Webster dictionary as: “a group of keyboard characters (such as 🙂 ) that typically represents a facial expression or suggests an attitude or emotion and that is used especially in computerized communications (as e-mail).” Even more specifically, emoticons are exclusively text-only. Humans have long used symbols as a form of communication. As far as when emoticons entered our internet-era lexicon, that can be traced back (or at least it is widely accepted to trace back) to September 1982. Scott Fahlman, a computer scientist, mentioned to a Carnegie Mellon message board that there need to be symbols to distinguish jokes and serious statements. We now know all too well the misinterpretation that comes with typed communication. Fahlman suggested 🙂 to indicate a joke; and 🙁 to indicate a not-joke. The story goes, the name came shortly after; “emotion icon.” And thus was born the emoticon. Emoji, on the other hand, are actual little pictures of (sometimes) recognizable things. And just as emoticons look dated and have a humble, every-day man beginning, the sleek emoji’s history goes hand in hand with it. Emoji came into being in the late 1990s and were developed by (surprise surprise) Japanese communications firm, NTT DoCoMo (don’t misread that surprise; we simply acknowledge that certain Asian countries have generally been on the cutting edge of things, technologically, so it doesn’t exactly confound expectations to see that superior emoticons and emoji have been developed there as well). The word comes from the two contracted Japanese words e and moji, roughly translated: pictograph. For further reading, please head over to The Guardian’s article on this subject; it is both fascinating and über-informative. But let’s all make it a point to stop using the words interchangeably. As previously mentioned, Twitter has some new things going on. The summer of 2015 was rough for Twitter, as the pressure was on to name a new CEO. In this day and age where tech companies blink and they are either sold or tank, Twitter’s been struggling to remain relevant. In October 2015, it was announced that interim CEO Jack Dorsey (also CEO of Square) would stay on as permanent CEO of Twitter (and Square–the man must not sleep). In no time at all, he and the Twitter team rolled out Moments, “the best of Twitter in an instant,” according to Twitter’s blog. And only today, Dorsey announced lay-offs of some 336 Twitter employees. But that’s sad and we’re here to make you smile. So don’t think about that last bit. Another recent development is super-sized emoji. Guys, they’re huge! Like, almost as big as stickers. Right now they are exclusively for messaging and actually only appear large when they are sent alone. Emoji next to text are still the little ones. Anywho, it seemed like BIG (heh heh) news at the time, a.k.a. last week . But hey, emoji are fun and we love ’em, so the bigger, the better, right? Speaking of fun with emoji (and emoticons by proxy), the moment you’ve been waiting for this whole article: Emoticons and Emoji that will make you smile. Bring it on! Do you remember Colorforms? No, now chloroform, Colorforms? They were reusable sticker activity sets that allowed children to make all kinds of stories with pre-existing forms. Well, with more and more emoji coming out every year, and a greater variety of expression possible, I suppose it was inevitable that people would eventually start making emoji art. Thanks to this, I’ll never be able to look at an Anne Geddes calendar the same way. Which is a slight modification of the old arrangement, when I just couldn’t look at them. But when it comes to “Emoji Art,” some people like to “improve” classic artworks by incorporating emoji. Here somebody goes to all the trouble to fix Van Gogh, and does Van Gogh do anything nice for him? Nope. He takes him to lunch, yes, but he makes him go Dutch. This next work took me a second to really get. At first, I thought it was just another emoji that had been put on top of Edvard Munch’s The Scream, but after a second I saw that the entire painting had been nightmarishly recreated using layered emoji. You will never see the horse head emoji the same way, I bet. Or wooden bridges. By which I mean, there probably are one or two cake icons hidden in there somewhere. 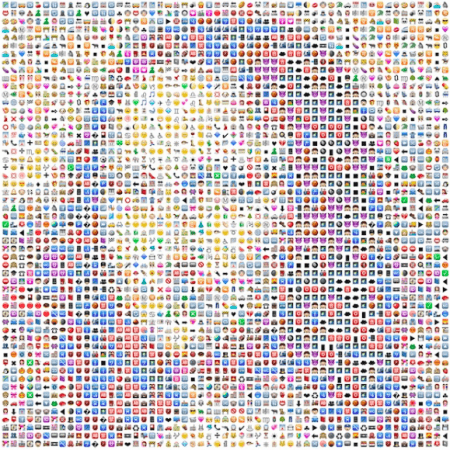 But there’s more to emoji art than that sort of complex stuff. 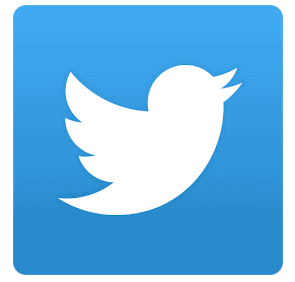 There are a lot of things you can do right in your favorite messaging service, such as Twitter. For instance, here’s an exchange that is a very simple one to do, but remains one of my favorites. This is a cool one not just because it’s a fun picture, but also because it plays around with the blue background of the text message, and so the blue background isn’t just something on which the picture has been placed, it is part of the picture. Much to the chagrin of the man who tried to drum up interest for this on Kickstarter. The ones that make us the smiliest are (and the word is not generally known or used in the West) kaomoji. They’re the ones that are meant to be read head-on. Like the simple yet elegant (*_*) or the classic, way more complex table flip (ノಠ益ಠ)ノ彡┻━┻. We do enjoy a good table flip. Well, that’s it, Friends. Be sure to check out our Emoji List for some more ideas (843 and some change to be exact) and an in-depth look at their meanings. You can also score some rad emoji and emoticons from that list. Happy Tweeting! Snapping! Texting! Messaging! Kik-ing! Whatever you do to communicate with the outside world, do it with an emoticon. Because nothing says real life and real emotion like a trivialized little symbol. And if there are any fun emoji projects we left out, or any of the ins and outs of Twitter you’d like to call our attention to, feel free to mention it in the comments!